Intel’s 10 nanometer Cannon Lake processors may not see the light of day before 2019, but that hasn’t stopped the firm from stoking the flames of anticipation. The company has officially posted details of just one of its Cannon Lake CPUs for laptops: the Intel Core i3-8121U. This is the very same 10nm processor that was leaked just days ago through a Chinese retailer, and Intel’s official specifications line up with details posted on that website almost exactly. 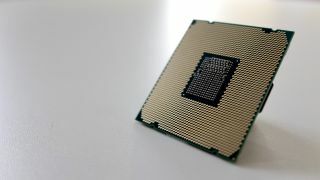 For starters, the posting confirms the 2.2GHz base clock speed and promises a 3.2GHz boost speed as per the retailer. Altogether this seems like a fast clock speed for an i3 processor, which Intel has confirmed to be dual-core with four threads. Wait, where are the graphics? Further details on the processor include a rather light thermal design power, or TDP, of 15W, which should leave plenty of headroom for other parts as well as generally longer battery life. Even more to this apparent goal of battery life gains are the two new types of memory, or RAM, supported by this processor: up to 32GB of LPDDR4 and LPDDR4X. Both of these new kinds of RAM are designed for low-power applications, meaning a smaller contribution to TDP and therefore less overall power drawn from a battery. However, what’s awfully odd about this processor spec sheet is the complete lack of a graphics core, or GPU. Almost every other mobile Intel processor comes with Intel HD Graphics of some level. The laptop that the processor was first found within, the Lenovo IdeaPad 330, is listed to include a discrete AMD graphics chip, which is great because otherwise it’d be a laptop with nothing to see. Is this a chip expressly designed for affordable gaming or multimedia use? With just a spec sheet to go off, it’s tough to say what Intel’s intent is with this mobile processor, but at least Cannon Lake is now a little less mysterious before its 2019 arrival.